The REEL HAIR HIGHLITER METALLIC PALETTE is used to streak hair, and/or to add metallic highlights which are many times required to eliminate the flat and/or dark look due to poor lighting conditions or film distortion. 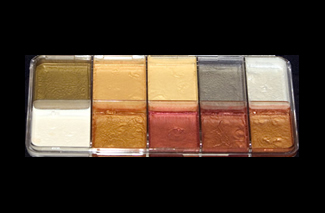 This palette may be also used to correct root hair when coloring is unavailable or not immediately practical. REEL HAIR HIGHLITER PALETTE can also be used on the skin.